The first step my successor and I took was to agree on a weekly informal conversation and I knew that conversations would be THE MOST SIGNIFICANT component of this transition effort. Keeping these conversations informal doesn't mean we can't inject some planning and structure into them. Since I also wanted to have a background reading component to the transition, I was already thinking about a list of books I could recommend. 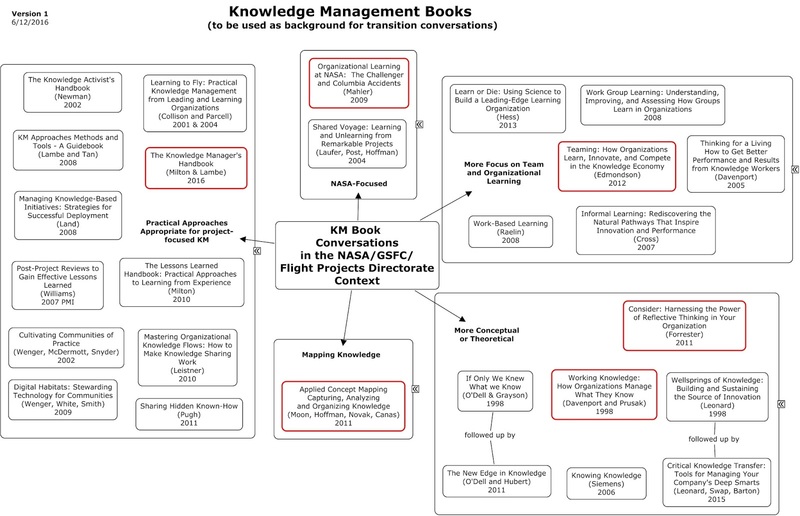 Obviously, book reading isn't an ideal way of transferring knowledge, so I thought about making at least part of our conversations related to specific KM books. We could talk about the key concepts and insights from the books, but most importantly connect them directly to the context within which my successor will be working. 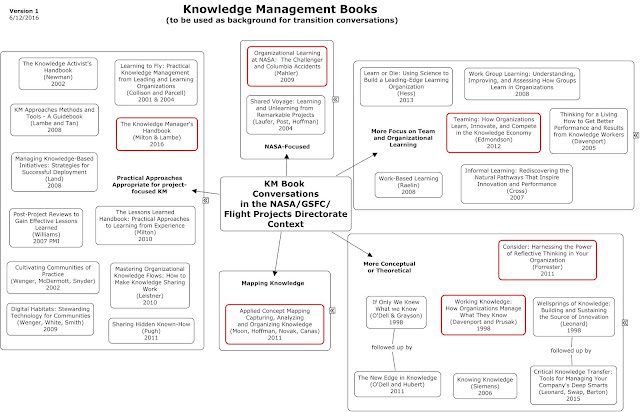 I couldn't help myself, I created a map of books I could recommend for these conversations. These are books I've read and books that have influenced my thinking. Out of the more than 20 books on the map, perhaps a dozen can be selected for their more immediate applicability and fit with the context my successor will face. At the pace of one book a month, we can cover 12 books during this coming year. This sounds great in theory. I don't know that it's going to work in practice. We'll see. Click on the map to open in a new tab.